Offering more choices to growing Indian millionaires, premium carmaker Mercedes-Benz on Tuesday re-introduced its super-luxury sedan Maybach in the country, the prices of which will go up to Rs 5.10 crore (ex-showroom Delhi). The German auto giant expects Indian luxury car market to be in the global premium league in the next 15-20 years. The Maybach, which was earlier introduced here in 2004 for about Rs 5 crore and was present till 2009, will come in two variants -- 57 S and 62 -- with price tags of Rs 4.85 crore and Rs 5.10 crore, respectively. "This car is only for super-luxury segment. Designed with meticulous attention to detail and kitted out of 21st century automotive technology, the cars are writing the next chapter in the history," Mercedes Benz India Managing Director and CEO Peter Honegg said. 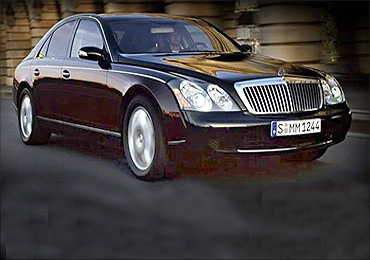 While the 5980cc Maybach 57 S can touch a maximum speed of 275 km, the 5513cc Maybach 62 can reach up to 250 km. "I am convinced that India in a foreseeable future, which is say 15-20 years, will be in a global premium league... Maybach makes a statement that we are the luxury carmaker," Honegg said. He, however, declined to share any sales target for the Maybach. In China, the company sells 20-30 units each year. The company will take 6-9 months for delivery of the car, which can be customised according to buyers' choices. The Indian super luxury car market is very small that goes up to only a few hundreds. Some of the major players include Rolls Royce, Bentley, Bugatti and Porsche. The Bugatti Veyron 16.4 Grand Sport is the most expensive car to hit the Indian roads so far starting at Rs 16 crore (Rs 160 million). When asked about his comments on Mercedes-Benz losing its leadership position in India for two consecutive years to compatriot BMW, Honegg said: "Number one position is not the ultimate target. We are here to sell cars...we have gained some market share last year." While BMW India sold 6,246 units, Mercedes-Benz India sold 5,819 cars between January and December, 2010. The luxury carmarket is estimated at around 15,000 units per annum. "We are not afraid of competition, competition helps you and it is necessary... May be we have to work little bit (more) for our brand," he said, adding the company will study if there is any "behavioural change" in customers opting for BMW and Audi cars. Honegg declined reports that the company is considering to launch its two-seater car 'Smart' in India. The stunning Audi R8 at Rs 1.33 crore!